After getting into the outdoors scene camping while 4-wheeling and day-hiking, I switched to backpacking in the early 2000's. I have backpacked extensively in Utah, Wyoming and Idaho along with California, Pennsylvania and Nevada. I have slowly been cutting my base weight to be able to go longer in duration and distance. I have done so mainly by using better gear and dumping heavy luxuries. I backpack year round in all weather, and usually take a free standing tent and a gas stove on all my trips. I love trying out new gear. 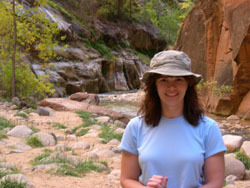 The author in the Narrows at Zion National Park, Utah. The Expedition WS4 came packed in a box that noted to be designed and produced to reduce environmental impact. It came with a 147 page user manual (in English, French and Spanish) that is small enough to fit in my pocket and a pocket guide that is larger than the user's manual. Hum. The WS4 has an oversized wide screen rectangular shape display versus a circular display found with many of the watches on the retail market. And boy is it ever oversized! The large face follows the shape of my arm due to the rectangular shape. It is easy for me to read the display since it is so large and the text is in a large font. I can even read it without my glasses on. The acrylic lens has orange markings on it for the clock; a squared off area for the time and the main function displayed; and the words altimeter, barometer, thermometer and compass in letters I can barely read on the left side of the face. On the steel top plate of the watch is the word "TIMEX" on the bottom and a logo for the expedition series on the top just above the lens. The watch case is made of a durable and lightweight resin. The band is 1.25 in (3.17 cm) wide and is made of resin. It has the words expedition embossed on it along the side of the buckle type fastener. Expedition is also embossed on the strap holder slide. The fastener is a traditional buckle type, which is metal. The strap is held on with four screws and it can be removed and replaced with a fabric type of strap if I wish. The case of the watch has three buttons on the right side. One round button in the center is for the INDIGLO night-light feature. The other buttons are rectangular shaped and are "start/split" and "stop/reset". There are two rectangular buttons on the left side are "set" and "mode". So far I am pleased with the Expedition WS4. It was easy to set up, I can actually read what is on the face, and it appears to be durable. It is on the heavy and large side as compared to my daily watches. But, this is no daily watch. It has been many years since I owned a multi-function watch, and it did not have all these features. So I guess I can expect it to be large any heavy. I was able to set the watch up and use some of the functionality in just a few minutes. Some of the functions I was able to use and set up without reading the directions. I guess I am like a man in that respect. The watch fits on my arm well and I have yet to wear it for any length of time. So far I like the rectangular shape because it follows the contour of my arm. I looked at the manufacture's website prior to receiving the product. And there were no surprises except for the size. It looked large on the website, but actually having something in my hands is no comparison to a web page. The features of the WS4 are listed on the website and a user friendly interface shows the key functions of the watch. The user manual, pocket guide, and how to cards can be downloaded. There is also a FAQ and testimonials. Conrad Anker (my favorite mountaineer) is testing this watch too. Cool! Mt. Woodson, California: The watch was hung on my pack strap while rock climbing and included day-hiking, mild bushwhacking and belaying. Mt. San Jacinto State Park, California: This was a backpacking trip with clear skies and sunshine. The high elevation was 9,000 ft (2,750 m). The low temperature was 17 F (-8 C). The watch was worn here over a quilt type of jacket/shell or a wool long-sleeve base layer. Bommer Canyon, California: The watch was worn over a wool long-sleeve base layer for a full moon night hike with clear skies. We hiked 3 miles (5 km). The temperature was in the low 50's F (11 C). Cleveland National Forest, Fullerton and Whiting Ranch California: The watch was worn here while mountain biking on several occasions over arm warmers or on bare skin. The temperatures were in the 50's F (12 C) to the low 60's (16 C). So far the Timex WS4 is performing well in the field. I must say that the large face of the watch can be easily read in the day or night (using the light feature) while worn on my arm or on my pack strap. The standard sized strap fits me on my bare skin, over my arm warmers, over my wool base layers, over my shell, or over my quilt type jacket. I like the idea of being able to track my activity highest/lowest and average altitude and temperature plus ascent, decent, my time above my base setting and the temperature ranges. Even though this feature tracks the barometric pressure range, I did not use those statistics for any data collection. This features has both text and graph views. I liked the graph view feature of the altimeter and the temperature range, the barometer graph is shown, but here again I did not use this data. This feature enabled me to have a quick glance at my statistics and made me feel good about my activity progress. I have to remember to use this feature I must start the chronograph or this data is not recorded. On a few uses I forgot to start the chronograph when I started my activity. When using this feature it is nice to see when ascending or descending how much elevation I gained or gave back. This information is not easily understood when just viewing the altimeter fields on the watch. While mountain biking at night and at base camp I found the INDIGLO night feature handy that I could press any button and the screen would like up for a few seconds. The INDIGLO light is a blue/green color that is not overly bright or harsh on the eyes. All the information on the screen can be easily read using the light. The night feature only lasts 7 to 8 hours and when stuck in a tent for 11 hours I forgot to reset it. However, I just pressed the INDIGLO button. I used the timer of the watch for timing pouched food cooking times. I also used it randomly to time non-eventful activities (like if something was going to start in 10 minutes or turn around time). I was able to hear the chime with no difficulty. It is faint but I was alert so I could hear it. The standard timer setting has 8 sets of chimes and then it stopped. I also set the timer up on repeat so that it repeats the timer and chimes 8 times until STOP is pressed. I would like to see the timer function that it also chimes without repeating the timer until STOP is pressed. Now for the alarm. While backpacking I had the watch in my sleeping bag because while not wearing the watch, the screen display was fading and the refresh between the screens was slow in the cold temperatures, around 25 F (-4 C). When I had the watch on my arm the screen was no longer fading and the performance was improved. It got down to 17 F (-8 C) outside and I am unsure of the actual temperature inside the tent. I did not want to wear the watch while sleeping due to the large face and possibly poking myself in my eyes. I set the alarm for Monday at 6 a.m. and I never heard it. There is supposed to be a backup alarm in 5 minutes, but I did not hear that either. I set the alarm for one time at 7 a.m. and I heard that alarm. I may not have heard the first alarm because I was in a deep sleep, the watch was in my sleeping bag, or the chime was faint. I am the type of person that needs two alarms blaring to wake up. I used the altimeter setting to set a base location, and a known elevation (used for calibration on the trip). The altitude alarm gives a chime and a screen display when the targeted altitude is reached. I used this to set the peak point on a mountain biking trail. The altitude does change slightly overnight and this is typical of altimeters when there is a change of barometric pressure. I found it helpful to set an altitude reference point for camp so the altitude can be calibrated easily. It took me a few tries to get this working correctly in the field because I did not have the reference manual with me. This set up is not as intuitive as the basic watch setting. But, Timex provided a pocket guide with the directions that I should have carried with me. At least the first time. I did not find the 36 hour display of the altitude very helpful. I used the activity review instead. The 36 hour graph was spanned over such a long period of time that it did not appear that I made significant gains during activities that were short in duration. I found the temperature reading to be accurate when the watch was not worn on my wrist or in direct sunlight. The temperature increased from 10 to 25 degrees when worn on my wrist. This can be expected. It took about 15 minutes for the watch to read the correct temperature when it was removed from my arm and placed in the shade. At times the weather function was not accurate. This is based off the barometric pressure. I did not need to rely on this data on my backpacking trip. I just laughed saying "It is going to rain". 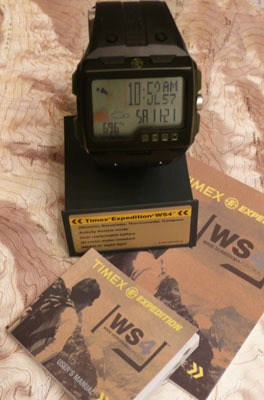 I am happy with the functions of the Timex WS4. I just wish it was slightly smaller. If I do not need a GPS on trips this watch suits all my needs. I have yet to change the battery even since it has been exposed to temperatures below freezing. Mt. 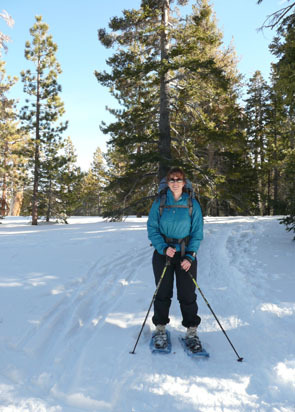 San Jacinto State Park, California: This was a snowshoeing day trip with windy conditions. The high elevation was 9,400 ft (2,865 m). The high temperature was around 48 F (9 C). The watch was worn here over a quilt type of jacket/shell. Orchard Hills, California :This was a night hike on Irvine Ranch Conservancy Land. The low temperature was in the 50's F (15 C). The watch was worn here over my quilt jacket. Whiting Ranch, California: The watch was worn here on a two day hikes. The temperatures were in the 60's F (16 C). 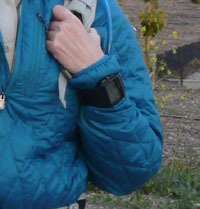 Peters Canyon, California:The watch was worn here after work for two day hikes. The temperatures were in the low 70's F (21 C). St. George, Utah: The watch was worn after mountain biking. The high temperature was in the high 50's F (15 C). So, far the Timex WS4's general features are working well. I am having some issues with the compass and the altitude setting. I sometimes still forget to start or stop the chronograph. Hence, my data review is skewed at times. But, this is user error. 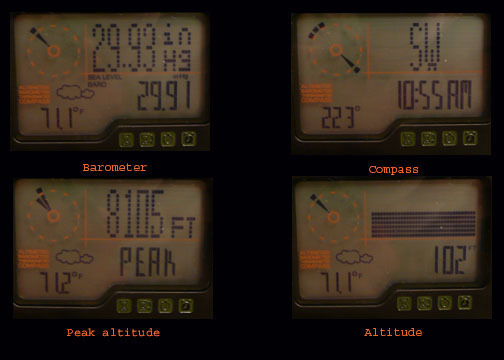 I have compared the altitude with known elevation and with maps. And I found that it is more accurate when I use the altitude settings for the base and add the additional known altitude settings. I reset the altimeter each time I use the watch, so it is more accurate. I can expect some discrepancy in altitude because this functions off the barometric pressure. For instance at the base of the Palm Springs Tram I set the altimeter to a known elevation and at the top of the tram the watch was off by over 300 ft (91 m). The tram does travel at a higher rate of speed than me walking and I expected this due to this type of altimeter. When hiking the altimeter is off by about 100 ft (30 m). The battery is still running strong and I have not encountered any major technical issues with the watch. I still think the size of the watch face is overkill. If some of the features on the left side of the face were removed, it would make for more compact styling. This watch rests flat on my wrist, but it snags on bushes and brush when I am walking by. I think if it were just a bit smaller, it would be more appealing to me. I could see it being this large if it had a GPS (where I would have to read maps), but then again it does not. I thought I would become more familiar with the digital compass. I was lost in the snow again this year at Mt. San Jacinto State Park. My friend and I were prepared this time with a working GPS unit. But, I thought I would use the digital compass feature to try to navigate in the correct direction. The compass was indicating south and I know for a fact I was facing west, because I was facing the sun set. I could not get an accurate reading. I even compared it with a standard compass that my friend had. What bugs me with the compass is that it can not be locked on. It turns off after 30 seconds. I then have to press start to use the compass again. I have calibrated the compass a few times by following the instructions in the manual, so I do not know why my readings are not accurate. I used it three times for orientation purposes at Orchard Hills on a night hike. Two out of the tree times it was correct. I determined this by using the stars (Orion) for directional purposes. I had the opportunity to use the watch in a different time zone. It was simple to set up the other time zone beforehand and then switch the watch to the current time zone I was in. The watch can be set for no more than two time zones. I found this feature also handy for day light savings time that occurred on March 14 th. Since the additional time zone I set for the watch was an hour earlier, and that is what I needed for daylight savings time; I just set the watch to my other time zone instead of resetting the time. I compared the barometric pressure to local weather stations and NOAA (National Oceanic and Atmospheric Administration). It was very close to the recorded barometric pressure at these sites, it was only off by .02 to .06 in Hg. But, the recorded referenced data was not at my exact location, sometimes a few miles away. 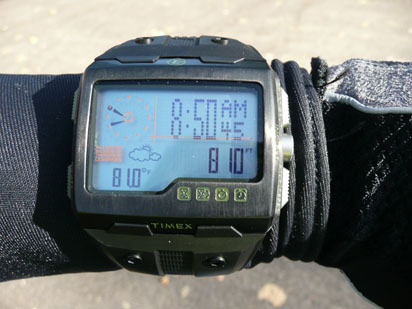 I am happy with the accuracy of the barometric pressure reading on the Timex WS4. The watch became wet after I dropped it in a puddle while hiking at Whiting Ranch. I was changing my layering system and I had to take off the watch. And there it went into the puddle. It worked perfectly fine after becoming wet. The puddle was not very deep. It did not go over the tops of my shoes. On my night hike at Orchard Hills people were asking me what time it was. It was dark out since the moon did not rise yet at that point. I know the location of the INDIGLO button from memory and I was able to easily locate it and let them know what time it was. Plus the button is silver so I can see it more easily than the black buttons in dim light. It would be nice if the button had a dim glow at night. The INDIGLO button is rounded and has a different texture than the other buttons. So, it is easy for me to find it by touch. I think the weather forecast function is more of a novelty. I am finding that it is not very accurate. The watch can be calibrated to reflect the correct weather, but I find that I seldom calibrate the watch this way. I generally know the weather forecast before heading out on my trip, and sometimes that is not very accurate. I just tend to look at the sky to have an accurate weather forecast. I wish there was a clip to hang the WS4 on my backpack instead of strapping it to the pack. I like to know the temperature when I am hiking and when I wear the watch on my wrist, the temperature is inaccurate because it is also getting heat from my body. When it is not worn on my arm it is mostly accurate and may at time only be off a degree or two. I am still determining if this is the watch for me. I am getting more into tracking additional data with my GPS watch. I will continue to use this on trips that I do not need my GPS watch functionality. Easy to set up, works out of the box for most functions. This concludes my reporting on the Timex WS4. Thank you Timex and backpackgeartest.org for providing me with the opportunity to test this product.